How Do Britons Feel About Driverless Cars? “Driverless cars are the future. We’re living in the motorised middle ages”. That controversial quote was used to headline an opinion piece by Martin Belam in The Guardian in March 2016. A profound statement especially following on from the very first public road testing of a driverless car in Britain, only yesterday. But mud sticks, as they say, and some people may have had these incidents in their minds when they voted in a recent poll we conducted through our social media channels. We asked MyCarNeedsA.com followers and friends how they felt about the prospect of sharing their streets with cars which were being driven autonomously and 42 per cent of participants admitted they were concerned. Could it be because we’re aware that it’s only a matter of time until automated cars will regularly be found around us? In mid-September, the US government released a detailed Federal Automated Vehicles Policy. For the first time, this laid down a 15-point safety assessment which must be undergone by any firm developing a driverless car. 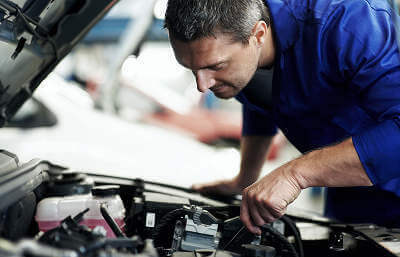 The criteria include: what data should be stored by the cars’ own systems, who would have access to that information, and how an autonomous control system should respond in the event of a crash. The same article also pointed out, however, that there’s support from the highest level for at least the principles behind autonomous cars. In the same article, he also noted their potential for increasing the mobility of people who otherwise would have to give up driving as they got older, with the possible consequence that they would become confined to their local neighbourhood, and even possibly, their homes. Will The Law Lead - Or Be Playing Catch-Up? Our national government wants to delegate more law-making powers to the Scottish Parliament and Welsh Assembly. And we’ve already seen the assembly in Edinburgh use these powers to change the ways in which drivers are allowed to behave, when, in December 2014, it cut the permitted alcohol level by more than one-third. Our law-making bodies will still have to wrestle with the issue that, simply because there are huge differences between the amount of traffic which uses some of our roads compared with others, any car without a human at the controls will have to be able to adapt to that different traffic, and consequently, risk levels. And in the absence of any hard and fast rules governing the relationships between a driverless car and one which has a driver, this probably explains why the mistrust is currently so high. But are we overplaying the concerns? 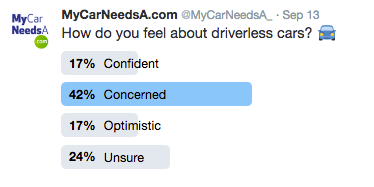 Maybe, if our poll is to be believed, with one out of three respondents being either ‘confident’ or ‘optimistic’ about a future where they could be relieved of driving duties on their regular journeys. She too was careful to acknowledge the possible dangers which lay ahead, but said the Government would partly fund a limited set of road trials of the latest technology associated with driverless cars. This was so that everyone involved in developing them could understand, and then address, the various challenges which lay between the development of autonomous vehicle control systems, and their eventual large-scale introduction. Aside from the London trial, others are being conducted, by separate private companies, one around Coventry and Milton Keynes, and the second in the Bristol area. At the same time, there’s also a wider public consultation process taking place, which you can get involved in by visiting https://gateway.commonplace.is/comment. There’s little doubting the scale of the huge stakes the world’s biggest car manufacturers are placing in various forms of technology aimed at making driverless cars a reality. Even the speculation of a tie-up between Apple and supercar-maker McLaren - although strongly denied by the F1 and supercar maker - points firmly towards such collaborations being heavily focused on bringing cutting-edge technical and research skills into play on shifting up gear in driverless car research. American reports even suggested that such a collaboration could result in a prototype car hitting the roads in 2019. So the final message to our poll’s participants, and the rest of us, is clear. There’s an almost unstoppable momentum building up around the introduction of driverless cars. It’s now up to all of us to choose whether we want to have a say in what happens from here, and how soon this might happen.